BELT HOLSTER FOR PUNCHDOWN TOOL Empty Canvas Case for 99PR Tool Roll Kit. The smallest outdoor case in this series. Equipped with B&W's standard air travel features: air pressure compensation valve and temperature range from -40 to +80°C. Removable, pre-cut cubed "pluck" foam insert in the bottom and foam in the lid. Equipped with B&W's standard air travel features: air pressure compensation valve and temperature range from -40 to +80°C. Removable, pre-cut cubed "pluck" foam insert in the bottom and foam in the lid. Inside dimensions: 9.8 x 7 x 3.7in Equipped with B&W's standard air travel features: air pressure compensation valve and temperature range from -40 to +80°C. Removable, pre-cut cubed "pluck" foam insert in the bottom and foam in the lid. Inside dimensions: 9.8 x 7 x 3.7in A heavy duty case that is watertight, crush proof and dust proof. 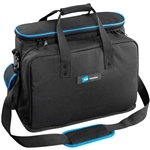 Padded lap-top compartment (17") with removable middle section and additional document partition. 8 pockets and 1 bag for small accessories on the outside. Interior dimensions: 17.32" x 12.59" x 7.08"
Exterior dimensions: 17.71" x 13.38" x 7.87"
Inside dimensions: 15 x 10.39 x 6.46in This carrying case was made for versatility and convenience with 29 tool pockets, a meter pouch on the inside, and 2 additional meter pouches on the outside.